Stagecoach North Scotland is inviting customers to review their proposed timetables. The move comes following the reduction in Aberdeenshire Council’s supported bus services across the area. Customers will have until Friday, February 22 to give their feedback, which will be reviewed ahead of the final timetables being submitted. The new timetables are expected to take effect from Monday, April 15. David Liston, Managing Director for Stagecoach North Scotland said: “We completely understand the pressures that Aberdeenshire Council face with the reduction in their budget. “We have worked closely together to identify solutions to minimise the impact of these changes for our customers. "Customer comments do help us to ensure we have optimised departure times and routes and would be grateful for all comments by February 22." Service X17 (Aberdeen – Westhill) – Monday – Saturday evening frequency reduced from every 20 minutes to every 30 minutes. Weekday 0640 from Aberdeen will terminate at Prime Four. Additional weekday journey at 0631 will operate direct from Aberdeen to Echt. Service 218 (Alford – Westhill) – Some evening journeys withdrawn. Service 37/X37 (Aberdeen – Inverurie) – various journeys retimed by up to 10 minutes. Four journeys withdrawn due to low passenger use but current service frequency will remain as per the current timetable. Service X20/420 (Aberdeen – Kemnay - Alford) – various journeys retimed by up to ten minutes. three weekend journeys withdrawn. Service 421/422 (Alford to Kemnay/Inverurie) – Two journeys Monday to Saturday withdrawn on service 421. Sunday service withdrawn on service 421. Minor changes to journeys on service 422. Service 221 (Kemnay – Inverurie) – minor changes to two journeys. Service 231 (Alford – Huntly) – now only school service and one return journey on Saturdays. Service 41 (Inverurie – Insch) – additional journeys added. Service 201/202/203 (Aberdeen – Banchory – Braemar) – Updates to the start times of some journeys Monday – Saturday by up to 15 minutes. Sunday service from Ballater to Braemar to be withdrawn. Sunday service to Lumphanan withdrawn due to the current 5 journeys only being used by an average of 3 passengers per day on Sundays. Service 119 will be revised to extend to Aboyne and Ballater offering a new connection direct to Garthdee, Aberdeen. Service 204 (Aberdeen – Strachan) – service to be withdrawn. *NEW* Service 210 (Deeside – Westhill/Kingswells) – a new commuter service will be introduced from Deeside to Westhill/Kingswells. The service will depart Banchory at 0700 and will serve Echt and Westhill before arriving at Kingswells P&R/Prime Four Business Park at 0800. Return journey departs at 1730 from Kingswells P&R/Prime Four and will arrive in Banchory at 1815. Service 270/271 (Fraserburgh to New Pitsligo and Banff) – journeys retimed by up to 10 minutes. 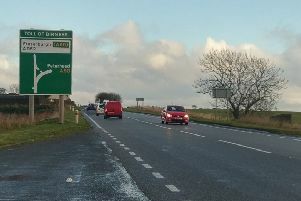 Service 253 (Fraserburgh to Turriff) – journeys to be withdrawn. Service 272/273 - some journeys withdrawn on 272. No Saturday service on service 273. Service 290/291/292 – four journeys withdrawn on service 292. Additional journey will operate Monday – Friday from Methlick to Aberdeen at 1940. Service 301/308 – Saturday service on service 301 to be withdrawn. Various journeys on service 308 to be withdrawn. Service 51 – Monday to Friday journeys retimed by up to 10 minutes. Saturday service to be withdrawn. Service 66 – Two evening journeys withdrawn. Service 67/68 - Minor revisions to the timetable with reduced evening frequency. Weekday service from Fraserburgh to Mintlaw at 0648 will be withdrawn. Service 69 (Fraserburgh – Peterhead) – some journeys withdrawn Monday to Saturday. Journey form Peterehad on Sunday at 0800 has been withdrawn due to low use. Service 74 (Fraserburgh – New Aberdour/Rosehearty) – some journeys withdrawn. Service 76/77 – Saturday evening journeys withdrawn. Service 81/82 – Two journeys withdrawn Saturdays. Service 84 – 1853 journey Monday – Friday and 1850 journey on Saturday are both withdrawn. Stagecoach North Scotland is working closely with Aberdeenshire Council to ensure that the changes have a minimal impact on bus users in Aberdeenshire. All feedback is welcomed until Friday, February 22 and can be emailed to nscotmarketing@stagecoachbus.com and public.transport@aberdeenshire.gov.uk.